I will not be posting Thanksgiving avatars as I do most other holidays. 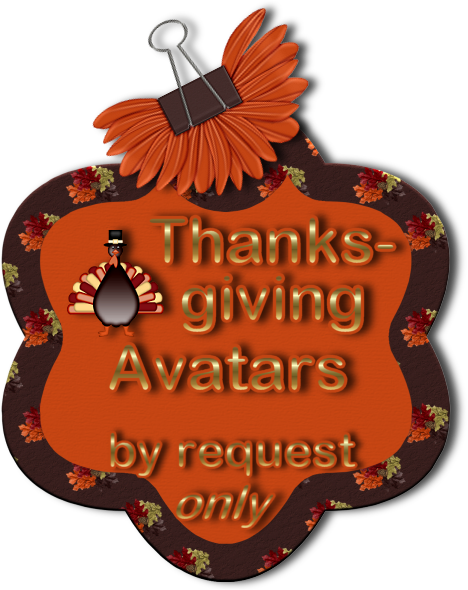 I have not made Thanksgiving avatars for everyone. (I have been working on Christmas for everyone!) Your autumn avatars and everyday avatars I have made for you are still posted in this thread. I never take them down, so if you need to change back into one and do not have it anymore, it is still here! I will be posting Christmas and Winter avatars on December 1. I saw your screen name while I was in the Caylee thread and got inspired to make and offer you these avatars if you want to use one! If you want to use one, please do. If not, it's fine. I enjoyed making them. Brandi you are so sweet and they are beautiful!!!!! I really like them both so it was hard to choose. I like the second the best and I love the forgetmenots. It's perfect. Thank you so very much. You do beautiful work and I have enjoyed your wonderful pictures of Haleigh in her thread too. You are one talented monkey!!!!!! Please accept my apology for my nakedness and I'll go right now and try to figure out how to get the clothes on or is that something that you have to do. If you do it then I like number two. If I do it I may have to get instructions from you. Thanks again !!!!! If I did this right I should be dressed now. I am glad you like them, 4getUnot! Excellent work on getting it posted in your profile. If you ever want to have it decorated for a holiday or want any tweaks (like a frame, etc.) just leave me a post and I'll be happy to do it for you. I had fun designing them for you. Brandi, please forgive the O/T. 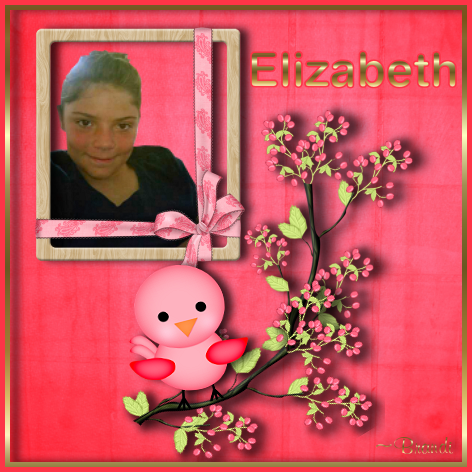 Elizabeth Olten was found today murdered. Would you have the time to do your magic with her image? 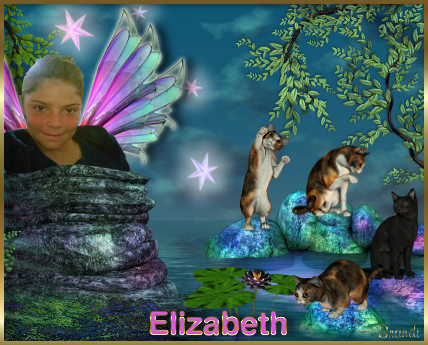 She was 9 years old, Elizabeth's family and friends have described her as a bashful fourth-grader -- the youngest of five children -- who loved cats but was afraid of the dark and would not normally have gone into the woods. Here is the most recent photo that has been out there. I understand if you are busy with Thanksgiving and do not have the time. Sure, I'll see what I can do to honor her. I made two of them animated and one static. 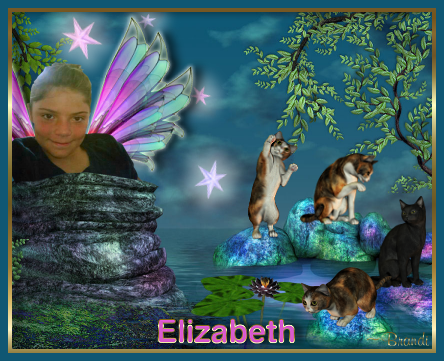 The first one has her wings and cat animated. The second, just the cat. I wanted to get something up for you tonight. I will make a couple others tomorrow so you have some more choices. If you have any suggestions, post them for me. I'll read here tomorrow before I make more. I added a cat, since you said she liked cats. And she was just 9 years old, so the cat is kind of a whimsical cat. My heart dropped when someone posted in the thread I was reading that she had been found today. So much sadness. One more with two different frames before I go to bed. This time I gave her lots of cats! Oh, and not animated, although I could animate it if you want. I wish there were more pictures of her out there! Thank you so much these have me in tears. They are wonderful. I was looking for more pictures as well and have not found any. 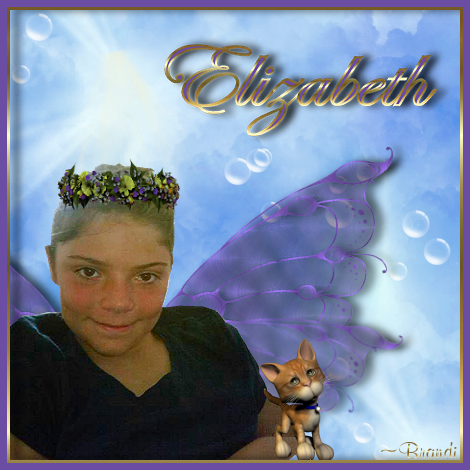 Her family has set up a facebook and even they have asked if anyone has more pictures if they could please post them. You are such a special person to do this. God Bless! If you come across any more photos of her, post them for me and I'll make some more. Feel free to do whatever you want with these I have just made. Thank you again you are so special to do this and so very talented. She was a lover of music, and some of her favorites included Hannah Montana and Taylor Swift. She loved horses, playing with her friends, and especially enjoyed baking cookies and doing puzzles with her mom. She also loved to play dress-up with her animals. I saw the obit picture. They framed the one I have been using. You'd think there would at least be school photos of her somewhere. Also, when you use the thumnails of these I made, they lose a LOT of quality. They do not look good resized. I noticed you were linking to small thumnails of them instead of the original image. Do you want me to make more with the information you just gave me above about her interests, etc? I have no idea what happened to them when I put them in photobucket. I opened a account there just to put these pictures up so if you can give me a tutorial of what to do and not to do when I am uploading them I would be very appreciative. Klaas mentioned that I may want to change the photo size option in my bucket but I can not find how to do that. I know why I have never opened an account there after messing up so badly today. I feel so bad as your work is so beautiful and I feel like I broke it and let you down. I am sorry.